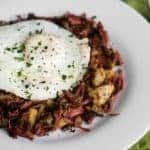 Corned Beef Hash is a flavorful and satisfying breakfast recipe that combines pressure cooked corned beef and potatoes with eggs. Corned beef is salt cured and marinated in tons of tasty spices. When cooked in the Instant Pot, it turns into moist shredded meat that is outstanding when fried with the creamy potatoes! Using an electric pressure cooker like an Instant Pot, combine corned beef, stout, water, and onion. Cook on high pressure for 90 minutes. Allow pressure to naturally release for 10 minutes once done cooking, then quick release remaining pressure. Remove roast and transfer to a plate. Remove onion and any other solid pieces from cooking liquid and discard. Add potatoes and cook on high pressure for 3 minutes. Quick release the pressure when done cooking. Remove the potatoes and set on plate with roast. To make corned beef hash, melt butter in a large saute pan over high heat. Shred corned beef and add to butter along with potatoes, mashing with your hands as they are added to the pan. Stir only occasionally so that you can get a nice crisp on the potatoes and meat. Reduce heat to medium low. Move all the corned beef hash to the outside edge of the pan (if pan is large enough) or transfer to a serving plate. Crack the eggs into the center of the pan. Cook to over easy or over medium and serve.